An Elegant in GTA San Andreas. The Elegant is one of the many 4 door cars available for use in Grand Theft Auto: San Andreas. Although it is very similar to the Premier, and is probably a corporate cousin to it as well, the Elegant is larger and heavier, closely resembling a 1992 Buick Roadmaster, but without the rear fender skirts. The Elegant, however, does bears a vertically split grille similar to the Premier's. Despite the Elegant's substantial curb weight, a very powerful V8 propels this rear-wheel drive monster quite impressively. Its performance attributes are very similar to those of the Premier, just on a larger frame: engine performance and handling are quite satisfying, although slight understeer is evident. This can, however, be compensated for with the E-brake around corners. Because of the vehicle's mass, it cannot reach quite the same speeds as the Premier, and requires longer stopping distances. This does, however, comes with the compromise of increased durability and better ramming capabilities, and handles well in gunfights. 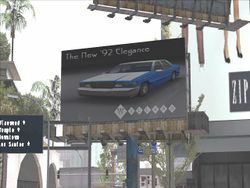 A billboard in Rodeo advertising a "'92 Elegance", hinting one of the car's original names. The car is associated with the Willard name. The car is also among the earliest in the series with a manufacturer's name associated with it, with a Willard badge, as evidenced by a billboard advertising a "'92 Elegance". As indicated by the aforementioned billboard, the Elegant's appearance is significantly different at one point during development, featuring a gray bumper (oddly, the rear bumper's color matches that of the body), simpler lower mask, and GTA III/GTA Vice City styled wheels. The default radio station in the Elegant is West Coast Talk Radio. In the parking lot under the Mulholland Intersection in Downtown Los Santos. Found around Downtown, San Fierro. Found around Tierra Robada and Las Venturas. This page was last modified on 19 December 2012, at 00:26.